The car parks at Amsterdam Port offer you a convenient and reliable Meet Greet service if you would like to hand over your car directly at the Passenger Terminal Amsterdam (PTA) and go straight to the check-in desk. Upon your return, your car will be returned to you outside the terminal, so you can begin your journey home. Or you can choose the transfer service and get to the port in no time in the company vehicle. Amsterdam Port Parking has never been so easy, safe and convenient! The Amsterdam-Rhine Canal connects the port of Amsterdam directly to the Rhine. Longer trips on the Rhine go to Switzerland or along the Main-Danube Canal to Nuremberg and Passau. There are also a number of cruises from Amsterdam on the Danube to Vienna and Budapest, with some shipping companies also offering cruises to the Black Sea and Bucharest. The cruise port of Amsterdam, on the bank of a bay called IJ, welcomes over 200,000 passengers every year. River cruises are just as popular as ocean cruises. At 600 m long, the 10.5 m deep quay offers sufficient space for three cruise ships. Additionally, there are berths for tourist boats and Rhine cruise ships. 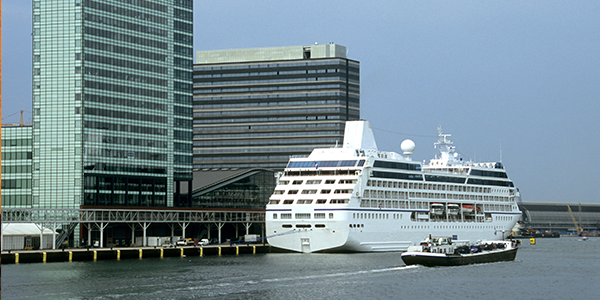 Amsterdam has two cruise terminals: the Passenger Terminal Amsterdam (PTA), which is located in the city centre; and the Felison Terminal, which is located in the Port of Ijmuiden.